AiPT! 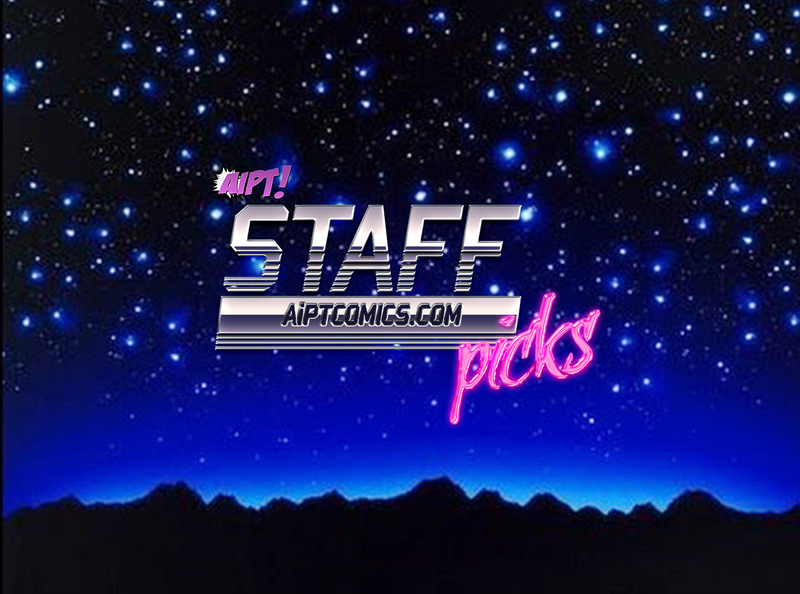 Staff Picks - May 2018 – AiPT! The end of the month is upon us. You know what that means: it’s time for the AiPT! Staff Picks for May! Deadpool 2 and Solo have hit the theaters — hopefully you have gotten out to see them. It’s not even June yet and we have had all these great films! This month Media/Content Editor David Brooke and Gaming Editor Patrick Hellen share their picks. Current favorite comic series: I read so many…this is a tough one! I’ve liked the latest Darth Vader and Poe Dameron series. Infidel is very good horror. Cable has surprised me at how much I dig it especially since I was never a huge X-Men fan. It’s a great time to be a comic book fan. Current favorite TV series: Westworld! I love mystery box shows like Lost and this one delivers every week. No matter what it seems to force you to think outside the box, it forces you to talk with your friends, and it generally allows for psychological discussion. Current gaming addiction: I’m trying to get into God of War, but PUBG seems to be my go to game. I don’t play all that much due to AiPT commitments, but it’s nice to just disconnect and get a few rounds of PUBG in. Last good movie you saw: I really liked Deadpool 2. I thought it was funny and did some great things with expectations and superhero stuff. Coolest recent purchase: I bought Mysterio! Marvel Legends has hyped this toy since SDCC last year and it finally came out three months ago, but was impossible to find. I was lucky enough to snag one off the Hasbro website when a new shipment came in. Summer movie season has started! We’ve seen Infinity War. What other movies are you looking forward to? What film do you think could be a surprise hit? I think Ant Man and the Wasp is going to be a big surprise. A lot of folks didn’t give the first film the time of day, but ended up liking it. This one is going to be all that and more. The movie I’m most looking forward to is the new Mission: Impossible. I love these films and I love how they do all the stunts which seems rare these days. There was a large amount of feedback from fans of Brooklyn Nine Nine that caught the attention of NBC and now the show has new life. What is a favorite TV show that you loved and wish that it would be brought back from the dead? Brisco County, Jr. was one of my favorite shows growing up and it only had one season. It was funny, had great western sensibilities, and a sci-fi element too. Oh, and this was prime Bruce Campbell. The zombie apocalypse has happened. There was a huge explosion. when you wake up, it’s just you and this one famous person that you have to rely on. Who do you hope this famous person is? Somebody with a lot of skills. Bear Grylls? Current favorite Comic series: I’m not reading anything current right now other than Saga, because I’m a BKV fanboy forever. I did recently re-read all of Saga’s back-issues, and I’m about to dive into a reread of Transmetropolitan, because if there’s anything that feels right in today’s day and age, it’s a saga about a crazy journalist using a bowel disruptor on a corrupt and scummy president. Current favorite TV series: Nothing. I’m not watching anything on TV right now. My kids watch cartoons, and we stream Voltron together whenever a new season drops, but other than that, I’m watching zero TV. It’s weird as hell, as growing up TV was a family destination on weeknights for Seinfeld, etc, and today it’s all streaming, so I can pop something smart on for the kids, and read or work on something the house needs. Current gaming addiction: I just replayed and 100%’d the Doom reboot, and loved every second of it. With the majority of shooters being Halo and CoD-esque, a throwback to the arcade and frantic action of early ’90s FPSes was welcome. I played a huge amount when it first came out, and then got distracted by Witcher 3 for the better part of a year. Next up, I’m about to dive into Wolfenstein II and try my hand at Gwent again, after they’ve re-balanced. At some point I’ll eventually cave and start playing Breath of the Wild and Witcher 3 again, because I can’t stop thinking about either game. Last good movie you saw: IT. With two little kids, I don’t get to see many movies in the theater, as babysitters cost 15-20 bucks an hour, so it’s got to be a BIG film for the Mom and Dad date night. So while I missed IT in the cinema, I just Redboxed it, and loved it. Finn Wolfhard stole the entire movie for me with his one liners. Coolest recent purchase: I just bought Hyrule Warriors for Switch. Last year, I snagged a used copy for Wii U and played with my son. At age 3, he had trouble controlling the characters, and didn’t really know what was going on. At age 4, he’s destroying monsters left and right, and fighting me for most enemies defeated. It’s a totally fun and mindless couch co-op. Summer movie season has started! We’ve seen Infinity War. What other movies are you looking forward to? What film do you think could be a surprise hit? THE MEG! They finally filmed one of the best worst books!! Reading it is an exercise in brutality, but it’s got a giant damn shark eating an entire beach of people! This is summer movie perfection, emulating Jaws, the best summer movie of all time. I can’t wait for how terrible this is going to be, and how much fun I’ll have hate/loving it. There was a large amount of feedback from fans of Brooklyn Nine Nine that caught the attention of NBC and now the show has new life. What is a favorite TV show that you loved and wish that it would be brought back from the dead? I actually prefer self contained shows with preconceived ends in mind. The Wire, The Sopranos, probably Stranger Things, and True Detective season 1 was essentially perfect. So when they get cancelled, there’s either a way to keep them going until the scripted end, or a way to use other media to achieve the same purpose. I think the easiest example is Firefly, but Serenity didn’t have the same magic the show did, and thus actually made me wish the show was the full experience. The zombie apocalypse has happened. There was a huge explosion. when you wake up,it’s just you and this one famous person that you have to rely on. Who do you hope this famous person is? Dave Grohl. We’re going to all die slowly from starvation and disease if we can somehow avoid the zombies, so at least with Dave you can get some seriously good barbecue and some awesome tunes.